Broker related topics are discussed quite often here. One of the reasons that led me to spend a lot of time on brokers is that even though I have many brokerage accounts, including account with Zecco, Scottrade, TradeKing, and Firstrade, I can always find something new or improvements at these brokers. That led to further evaluation of the brokerage firms, not just the brokers themselves, but also their products, services, and tools, because a single change could affect my entire perception of the broker. For example, I have my account with Zecco for more than four years now. Back in 2007 when opened my account, the broker was very unique as it was the only one that didn’t charge commissions for trading stocks. Though I doubted their model could last, I still joined to take advantage of their commission-free trading offer and I made quite some free trades, though Zecco was only a play account for me. While the free trades were good, they didn’t last long. Since 2008, Zecco has gradually added additional requirements for investors to qualify for the free trees and eventually killed the program early this year. After the roller coaster experience with Zecco, I came to the conclusion that when evaluating a broker, commission cost isn’t and shouldn’t be the only factor that determines the outcome. Free trades from Zecco was good, but there was no guarantee that they will stay. The same thing also happened to Options House, another discount broker which started its stock commission at $2.95, but later increased it to $3.95. On the other hand, we also brokers that charge higher commission than Zecco and Options House did, but their commissions have been kept steady for years. Examples in this group of brokers include Scottrade and TradeKing, two very popular brokers that have maintained their commissions for years. That kind of stability is also desirable because for them, if there’s any of their pricing, it will be likely a cut not an increase. As a customer of Scottrade for nearly a decade, I have most of my investment assets in non-retirement accounts with the firm because I am confident that I won’t wake up one morning and find that my trading commission will go up and, thus, need to move the assets to somewhere else that’s cheaper. I have reviewed many brokers before and have shared my experience such as opening an account and making a trade with them, but the discussions scattered all over the place, making it especially difficult to compare brokers side by side. To change that, I am going to use this page to provide comprehensive information about discount brokers, including both I use and don’t, to make multi-broker comparison easier. It will not be a review-all page. Instead, I will only highlight key differences among brokers, those that I think matter the most, while at the same time link to my previous discussions for those who are interested in finding out more. The first batch of brokers that I will compare first are those I have an account with, Zecco, Scottrade, TradeKing, and Firstrade. The reason I choose these first is they are all very popular among investors and a lot of similarities exists among them, from trading commissions to products and service. As you can see from the above table, even though Zecco has increased its stock and ETF commission from zero to on par with TradeKing, it’s still relatively low comparing to others. Even though many people, including me, don’t like what Zecco had done for its commissions, it’s still a solid choice, from the trading cost point of view. And Zecco has something that nobody else has so far, Zap Trade, the trading tool that lets you trade anywhere on the internet, without even having to go to your account. 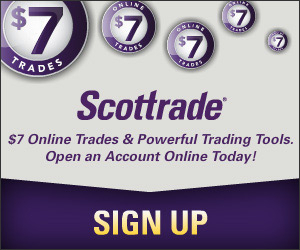 If you are want to buy or sell ETFs for free, then you may want to consider Scottrade. Scottrade recently launched 15 diversified low-cost ETFs and as a customer, you can trade these ETFs without commission, saving money on trading. As for TradeKing, not only it has low commission for stock and ETF trades, it’s also rated as one of the best brokers for options trades.